Mystery Monday this week fell on St. Patrick’s Day, so to celebrate, the following image was posted for the mystery fossil of the week. St. Patrick was well known for driving all the snakes from Ireland, at least so the myth goes. In reality, there never were any snakes in Ireland for St. Patrick to drive out in the first place. But unlike Ireland, Arkansas has always had snakes. 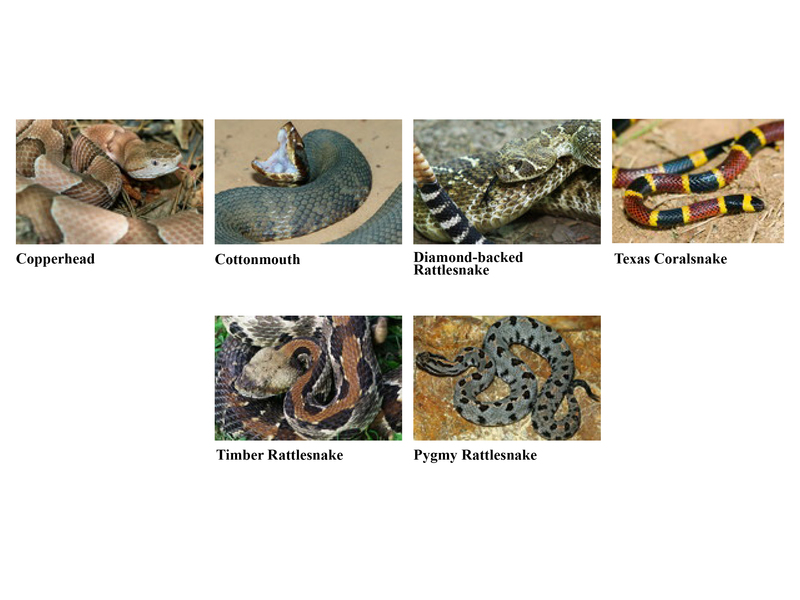 Right now, we have a diverse population of snakes, including boasting more different types of venomous snakes than most other states, being one of only ten states that have all four types of venomous snakes in the country (there are roughly twenty separate species, but they all fall into four main groups). Here you may find the copperhead, coral snake , cottonmouth (aka water moccasin), and the rattlesnake (including the Timber, Western Diamondback, and pygmy rattlers). At least we can take comfort that we are just outside the ranges of the Massasauga and Eastern Diamondback rattlesnakes and we don’t have the diversity of rattlers seen in places like Arizona and Texas (which may win the prize for most venomous snakes in the country if both species number and diversity are taken into account). In the past though, we also had other snakes, including Pterosphenus schucherti, also known as the Choctaw Giant Aquatic Snake, a giant sea snake that lived here in the late Eocene roughly 35 million years ago. The Eocene was a much warmer time. In fact, this period falls at the end of what is called the Palaeocene-Eocene Thermal Maximum. There were no polar ice caps during this time, with at least double the amount of carbon dioxide and triple the amount of methane than what we see now. Because of this, Louisiana was pretty much under water and Arkansas had wonderful ocean front property, along with a lot of swamps and marshes. It is likely the cooling during this period into the Oligocene Period, that caused the extinction event that wiped out these snakes, along with several terrestrial mammals, including a variety of Perissodactyl horse ancestors, artiodactyls (cloven hoffed mammals), rodents, and primates. Pterosphenus model at the Florida Museum of Natural History. It is too wide, though, as noted by the staff of the VMNH paleontology lab, who took this picture. This was the perfect environment for a number of different snakes, although we don’t have fossil evidence of many. One that we do have is of Pterosphenus. 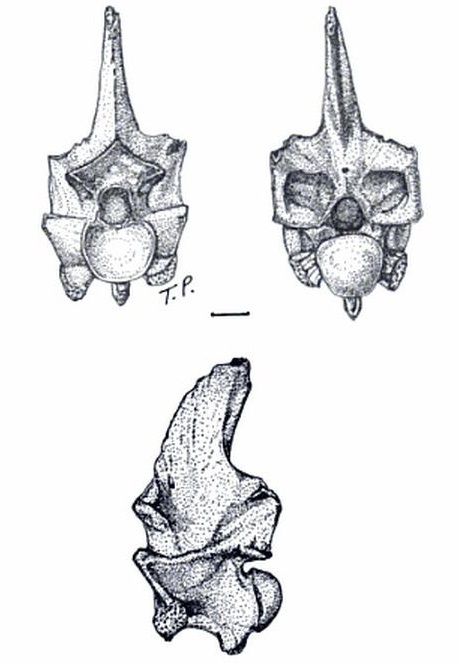 This snake had tall, narrow vertebrae, indicating adaptation to an aquatic lifestyle. In fact, it probably was not able to support itself on land very well due to its thin body. Sea snakes today rate as some of the most highly venomous snakes in the world. However, there are nonvenomous ones as well, such as the marine file snake, Acrochordus granulatus, which live in coastal regions between Asia and Australia. Those of today are relatively small snakes, ranging from half a meter to just over 2 meters (2 feet to 7 feet or so). 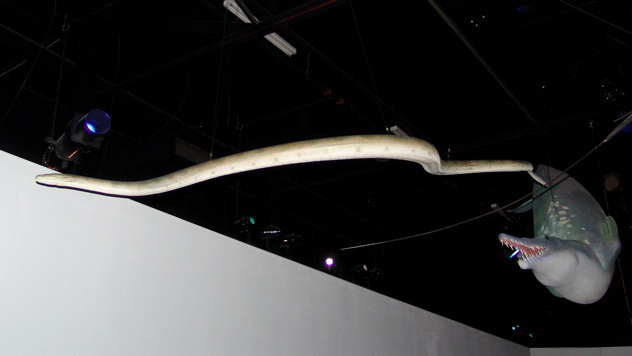 Pterosphenus, on the other hand, reached lengths of 2.3 m to 5.1 m, or possibly larger. Unfortunately, we don’t know a whole lot about these snakes, other than they were clearly aquatic. The bones that have been found with them, such as whale bones, have indicated marine waters. Fossils of these snakes have been found in eastern Arkansas, in Saint Francis County in the Eocene deposits around Crow Creek called the Jackson Group. By paleoaerie in Fossils of Arkansas, Mystery Monday, Paleontology on March 21, 2014 . Interesting blog! Looking forward to reading more from you.